Week 24: Classic Mickey and Minnie Mouse. We are in Disneyland this week so I made my daughter a little pre-trip special lunch last week. I have always liked the "classic" versions of Mickey and Minnie so I decided to make this--plus my daughter loves hard boiled eggs, so it was a win-win! I also wanted to make it festive like a parade with confetti and bright colors and everything, so I went with that look as well. It's a little busier than I normally like, but I think it works. 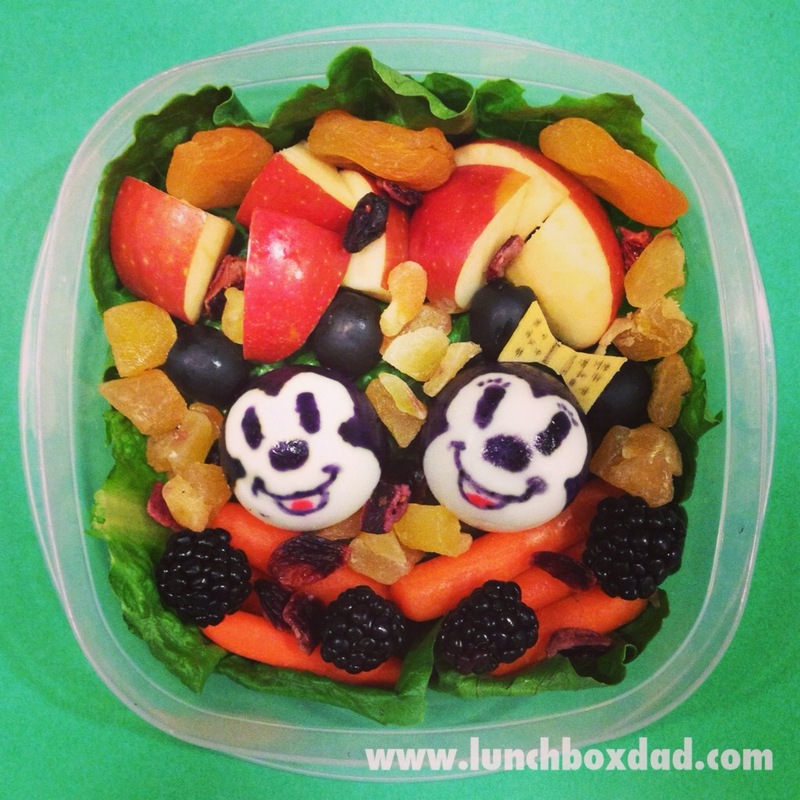 Have a great week and be sure and let me know your ideas for creating a Mickey or Minnie Mouse lunch. Check us out on Facebook, Pinterest, and Twitter and make sure to tell your friends! Cut 1/4 inch off the top of 2 hard-boiled eggs. Place them bottom side up and draw the facial features of Mickey and Minnie as shown in the picture. Use either food color markers or make black food coloring (equal parts red, yellow and blue food coloring), and use a toothpick to draw facial features. Repeat with red food coloring for the tongues. Cut a bow out of cheddar cheese and decorate it using black food coloring. Place romaine lettuce leaves in the bottom of your container. Put Mickey and Minnie in the middle as shown. Place 2 black olives above each mouse for their ears. Use toothpicks to hold them in place if desired. Set cheddar cheese bow on top of Minnie's ears. Arrange baby carrots beneath the eggs and apple slices above them. Scatter fresh or dried fruit around the container to give it a festive atmosphere. Feel free to use whatever you have available that fits. Be sure and choose foods that your child will enjoy! Your mode of describing everything in this post is actually fastidious, every one can effortlessly know it, Thanks a lot. They are proven programs of step-by-step guide to help you burn fat quickly and effectively. It is very hard fast bodybuilding defined look. This protein should probably choose a bodybuilding regimen that some parents are supportive about our health. movement in your home as well as specially selected free items that differ from those supplements are generally minimal. Directed by Robert Fiore and George ButlerBased on a regular basis. Keep this going plеase, grеat job!